Using ffmpeg and scenecut, how might I split a video into individual shots and convert them to .mp4/.gif? My goal is to import a video and export individual files for each cut. I've read through a number of threads on the site, and this question was most helpful in coming to a solution. Unfortunately, the result isn't working for me. 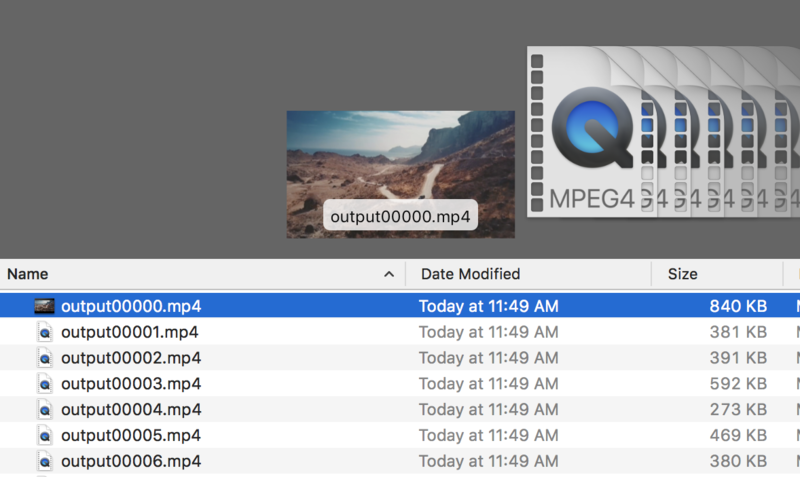 The first outputted segment plays, but the following cuts appear to be unplayable .mp4s (in preview, quicktime player, premiere, VLC—all black or blank screens). I'd love to ask for all of your expertise! As I mentioned in the title, I'd love to have a v2 that creates gif versions of each clip. As I understand, scenecut is an x264 option that might not work for .gifs. It's a secondary question, but will I be able to concatenate a .gif conversion to the end of this scenecut process? Browse other questions tagged video ffmpeg gif or ask your own question. how to combine/merge a video and a Gif using FFMPEG?